Erika Balog, IHES, France, 2001-2003: bioinformatics. Yasaman Karami, Université Pierre et Marie Curie. 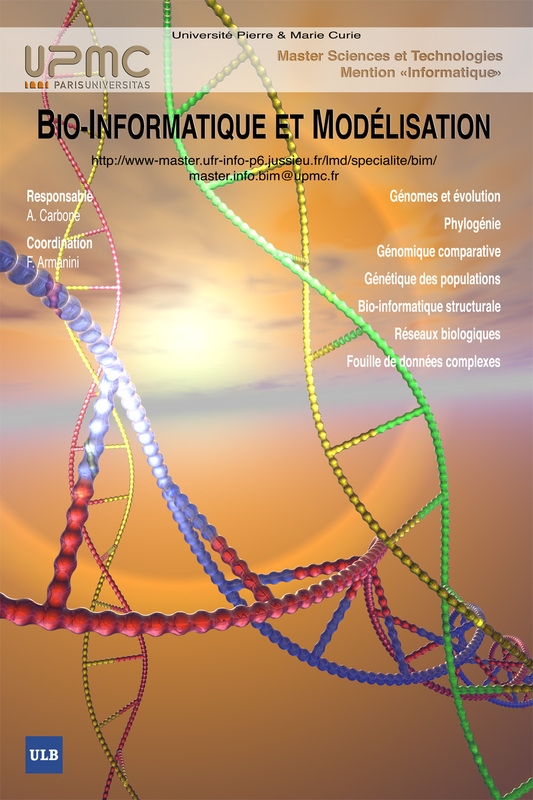 Bioinformatics: molecular modeling and sequence analysis approaches to coevolution; september 2013 - november 2016. (Co-advised with Elodie Laine) Following position: postdoc at Molécules Thérapeutique in silico lab, Université Paris Diderot, Paris, France. Ari Ugarte, Université Pierre et Marie Curie. Bioinformatics: protein domain prediction in metagenomic sequences and applications to marine metagenomics; october 2012 - december 2016. (Co-advisor with A.Falciatore) Following position: engineer at the Institute Cardiometabolism and Nutrition (ICAN), UPMC, Paris, France. Raphael Champeimont, Université Pierre et Marie Curie. Bioinformatics: sequence evolution and models of coevolution to identify genetic mutations; october 2011- december 2014. Following position: engineer at the Observatoire des Sciences et des Techniques, Paris, France. Juliana Bernardes, Université Pierre et Marie Curie and Universidade Federal de Rio de Janeiro, Bresil. Bioinformatics: remote homology, september 2009-March 2012. (Co-advisor with Gerson Zaverucha). Following position: postdoc at the Department of Electrical Engineering, Machine Learning Laboratory, Universidade Federal de Rio de Janeiro, Bresil. Linda Dib, Université Pierre et Marie Curie. Bioinformatics: protein coevolution and motif search for detection of weakly homologous proteins; january 2008-March 2012. Following position: postdoctoral position in Nicolas Salamin Lab, Department of Ecology and Evolution, Université de Lausanne, Switzerland. Anthony Mathelier, Université Pierre et Marie Curie. Bioinformatics: algorithms for the detection of new microRNA and their targets and applications; september 2006-september 2010. Following position: postdoctoral position in Wyeth Wasserman Lab, Center for Molecular Medicine and Therapeutics, The University of British Columbia, Vancouver, Canada. Julie Baussand, Université Pierre et Marie Curie. Bioinformatics : alignment of distantly related proteins, and coevolution of amino-acids in proteins; september 2004 - march 2008. Following position: EMBO fellow at theDivision of Mathematical Biology, National Institute for Medical Research, London, UK. Stefano Borgo, Department of Mathematics of Indiana University at Bloomington (USA) and Department of Computer Science of the Université de Paris 12. Logic, complexity and parallelism; co-direction with Prof.Daniel Leivant. Current position: Research Fellow, CNR, Bolzano, Italy. Students come from several different backgrounds at the interface with mathematics, physics, computer science and molecular biology. Computer Science and bioinformatics: Tamara Front, Université de Paris 12, 2001. Alexis Darrasse, Linda Dib, Pierre Franquin, Anthony Mathelier, UPMC. 2006. Victoria Dimitrova and Sijia Niu, UPMC, 2011. Computer Science and logic: Nicola Piccinini, University of Verona (Italy) in the framework of the european exchange program ERASMUS-SOCRATES. Co-advised with Prof. Gianluigi Bellin, 2000. Bioinformatics: Stephane Peugeot, Université de Paris 7, 2008; Gaëtan Poncelin de Raucourt, ENS and Université de Paris 7, 2006 ; Julie Baussand, Université de Paris 7, 2004. Biomathematics: Ladislas Trojan, UPMC, 2005 et 2006. Mathematics and Computer Science applied to Biology: Anissa Sadik, Université d'Evry, 2005. Biophysics and Biochemistry: Cyril Deremble, ESPCI and Université de Paris 6. 2003. 15 interships. Subjects: computer graphics, formal languages and computer graphics, cellular automata, coding theory and symbolic dynamics, the language XSL, computational models based on DNA, manipulation of genomic sequences, secondary structures of RNA and transcriptomic and proteomic levels in yeast, algorithms for phylogenetic trees reconstruction and comparison, algorithms for multiple alignmentof distantly related proteins.